Trustmarks are the images or logos that retailers can place on their websites to show that they have passed various security and privacy tests, and reassure customers that it is safe to shop on the site. But how relevant are these logos from organisations like Verisign or McAfee? Have customers even heard of them? Would other security reassurances do the same job? Econsultancy has been using one such trustmark for some time on our privacy page, to follow best practice, improve conversions, and to reassure customers who may harbour doubts about the site. However, we have found is little evidence to suggest that it has helped. Instead, it’s more likely that the general experience of the website and the reputation of the brand has more importance. Based on this, and the time-consuming process of filling in forms, we’ve decided to do without this third party endorsement. So, should etailers bother with trustmarks? There is some evidence that consumers are looking for reasurances about security when shopping online; a recent Cybersource survey found that 85% of UK online shoppers look for signs that the website they are thinking of buying from is secure. Companies like McAfee claim that their trustmarks are responsible for higher conversion rates; the company says that retailers using its service see an average 12% in conversions. The same McAfee-sponsored survey also says that 47% of shoppers look for trustmarks when shopping on lesser-known websites. Matt Curry tested one such trustmark logo on the Wiltshire Farm Foods website, and found that the green bar that appears when you have a class 3 certificate, alongside an explanation of the verification process, outperformed the security seal and the padlock logo. The message here is that a lot of logos etc are just adverts for those companies, rather than any use to the user. What you should do is educate the user as to what’s important, what to look out for, rather than relying on a single logo or company. Matt also makes the point that having these logos means another call when customers are loading the page, and can cause a noticeable delay, especially at peak periods. The intention to offer lots of reassurance is a good one, but it may have customers wondering why the retailer is so keen to reassure them. This is also the case with Tesco, though it could be argued that is a retailer is big enough and well-known enough, then trustmarks are irrelevant. People know from experience that they can rely on Amazon, so no further security reassurance is needed. This may not be the case with lesser-known retailers though. A customer may find the product and the price they are looking for, but if they haven’t heard of the site, then there may be nagging doubts about security. Trustmarks are recommended by Dr Mike Baxter in the Online Retail Checkout Report that he wrote for Econsultancy, though it is important to note that this is just one of several factors that help customers decide whether to trust a website with their card details. Clarity of product and price information. 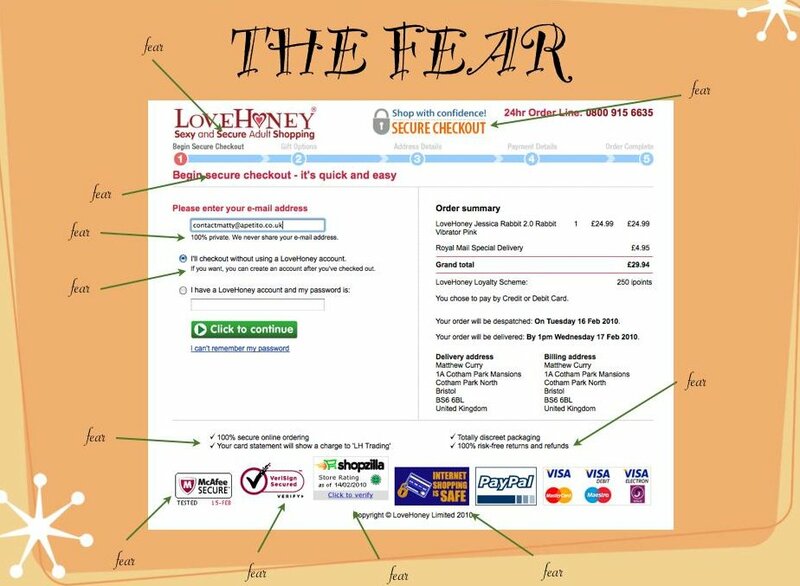 The total price of the purchase should be made clear before customers enter the checkout, and a reminder during the process, or before final confirmation of the order is also desirable. Being coy about extra charges or only revealing them at the last possible moment will not make customers trust the site. Reviews of both products and retailer can provide more credibility and reassure customers that, since others have has a positive experience, they are safe to shop at a site. If customers can see clear contact details, a telephone number or live chat option especially, then they will feel more confident that they can get in touch if they have any problems. Broken links, slow-loading pages, roadblocks in the process, or simple spelling errors will all have customers thinking twice about trusting a site with their card details. If I find a site I haven’t heard of, I’ll put the brand name into Google and see what comes up. If customers do this and see any negative comments left on comparison sites, forums, or Twitter then they will think twice. With real time search now showing results from Twitter, this is even more likely. If you’re site is easy to use and navigate around, customers are more likely to trust it. If it looks like this, then maybe not. I’d love to read any feedback from retailers and anyone else on this issue – do trustmarks make a big difference to your conversion rates? Which are the most effective ones to use? What other factors matter most? Virgin Trains released an iPhone app recently, which is a bit of a disappointment and, judging by the low ratings it has received so far, the users seem to think so too. The app gives information on Virgin Trains services, and that’s about it. The opportunity was there to create a useful app for customers, as thetrainline and Cross Country trains have done, but Virgin has missed this chance. The link between retail and publishing has always been strong. A product promoted in print sells products that are available online or in store. Thanks to online, the link is getting stronger, and now the lines are becoming blurred, as retailers become publishers and publishers begin to move into retail.